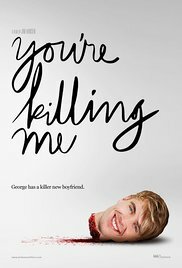 'YOU'RE KILLING ME' is one of those films that you come across and you can't quite work out why it isn't more talked about. A great combination of comedy horror and romance, strange bed fellows for sure but it works. When George a narcissistic wannabe internet star meets Joe they hit it right off and begin dating. Now for some people Joe might seem a little odd, distant even downright creepy, our egotistical George sees Joe as nothing but quirky, even to go as far saying his new boyfriend "isn't scary, he's gorgeous." But while George believes that Joe's dark humour of killing is all fun and games it soon becomes apparent that maybe Joe is really killing people. The way Joe finds himself after being lost in the world and now going around killing is therapeutic and you can't help but like him. This was well directed by Jim Hansen who has a wide variety of skills and one of them is put to good use here as he was the costumer on 'KILL BILL 1 & 2'. The campy humour and pokes at pop culture will have you laughing. So next time a stranger comes up to you on the streets making jokes about killing and you start dating just be sure they are joking before they meet the family. Also look out for a cameo from T.V. star Mindy Cohn (The Facts Of Life) as the helpful passer-by towards the end of the film.